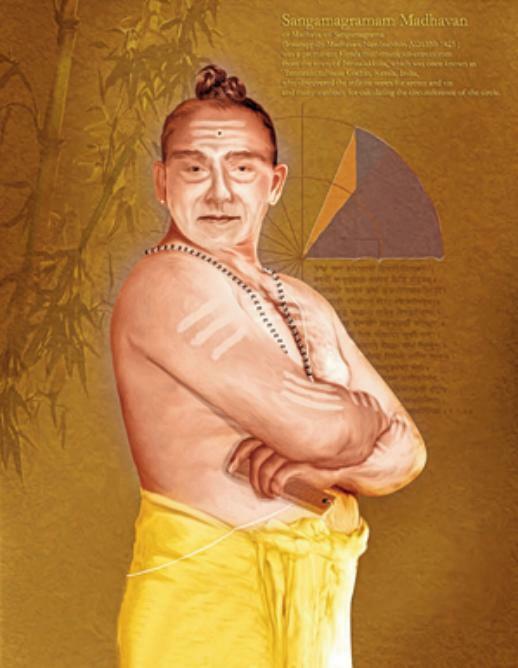 Madhava of Sangamagrama (c. 1340 – c. 1425), was an Indian mathematician-astronomer from the town of Sangamagrama. His writings were later transmitted to Europe via Jesuit missionaries and traders who were active around the ancient port of Muziris at the time. As a result, it had an influence on later European developments in analysis and calculus. His birth place Sangamagrama is present-day Irinjalakuda near Thrissur, Kerala, India. The first term is the product of the given sine and radius of the desired arc divided by the cosine of the arc. The succeeding terms are obtained by a process of iteration when the first term is repeatedly multiplied by the square of the sine and divided by the square of the cosine. All the terms are then divided by the odd numbers 1, 3, 5, …. The arc is obtained by adding and subtracting respectively the terms of odd rank and those of even rank. It is laid down that the sine of the arc or that of its complement whichever is the smaller should be taken here as the given sine. Otherwise the terms obtained by this above iteration will not tend to the vanishing magnitude.